Home › Tools & Resources › Publications › What is Transformation? What is Transformation? is a must-read for anyone working for a more just and sustainable world. The paper examines the endemic challenges in progressive movements, and lays out compelling and inspiring solutions to change the way change is made. It explains the value of a transformative, systems-based approach to organizational change, with quotes and stories from progressive leaders and thinkers, some of which will surprise you. This publication is an engaging introduction to how we can transform our organizations, our movements, and our world for the better. Download the PDF below or email us to order a physical copy. 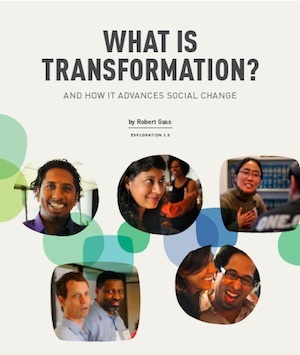 For a more in-depth look at transformation in action, we recommend Transforming Organizations.